Orange County Locations...San Clemente, Dana Point, Laguna Beach, Corona Del Mar, Newport, Huntington Beach, Sunset Beach, Seal Beach. From Malibu to Long Beach, the beaches in Los Angeles County are known world-wide. Each Beach area is different. Sycamore Cove and Leo Carillo are private and beautiful, Malibu with its rocky coves, Santa Monica with its wide sandy beaches, the South Bay where the beautiful people live, beautiful San Pedro and Palos Verdes, all the way to Long Beach where we have our secret beach locations. For Just the 2 of you or a couple hundred guests we have a customized package for you. Each beach has its own different requirements, permit fees, insurance and set up requirements. Our job is deal with the jumble of the various City, County and State bureaucracies so all you have to do is SHOW UP. Click here to go to our Los Angeles County Main Page. 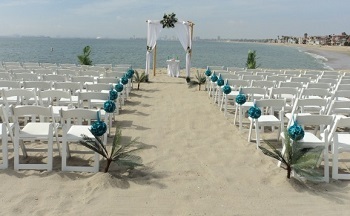 Orange County Beaches are a perfect place to tie the knot. From the North, Seal Beach has tranquil beaches, Sunset Beach offers intimate walk ons, Huntington Beach is high energy and hip, the rocky cliffs and coves of Corona Del Mar and Laguna Beach, amazing overlooks of Dana Point, and the sleepy beach town of San Clemente to the south dot the shoreline. Brighten up your wedding with our Amazing Floral Designs. From a Simple Boquet or Custom Lei to a full blown Floral Extravagaza. Our in house florists will help you through the process of choosing the floral you desire. We can design the floral for the arch and aisle decoration to make your ceremony burst with color. If it is just the two of you we deliver the floral to your location on your wedding day.